Nineteen of us met, along with bed bugs, scorpions and swarms of mosquitoes at the church camp in Bani. 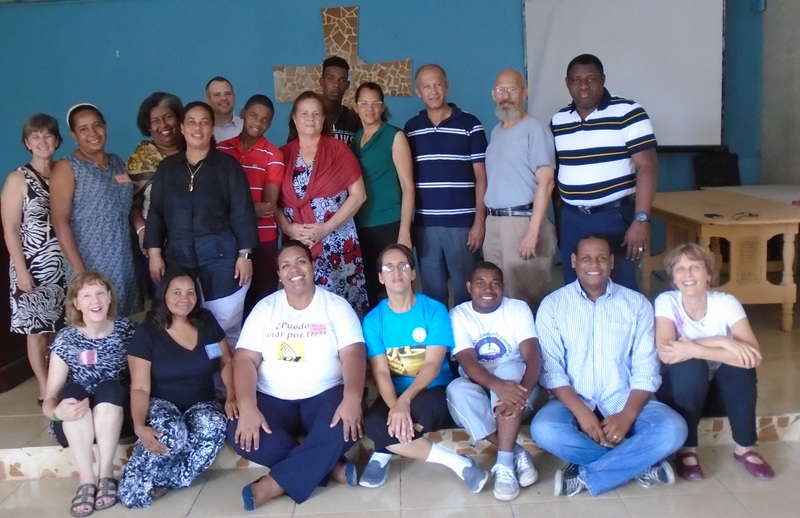 No one seemed to give the critters notice since we were all so busy with the task at hand – which was writing Sunday School curriculum for all the congregations in the Iglesia Evangelica Dominicana (IED) churches in the Dominican Republic. It was a very busy and exciting 2 1/2 days. 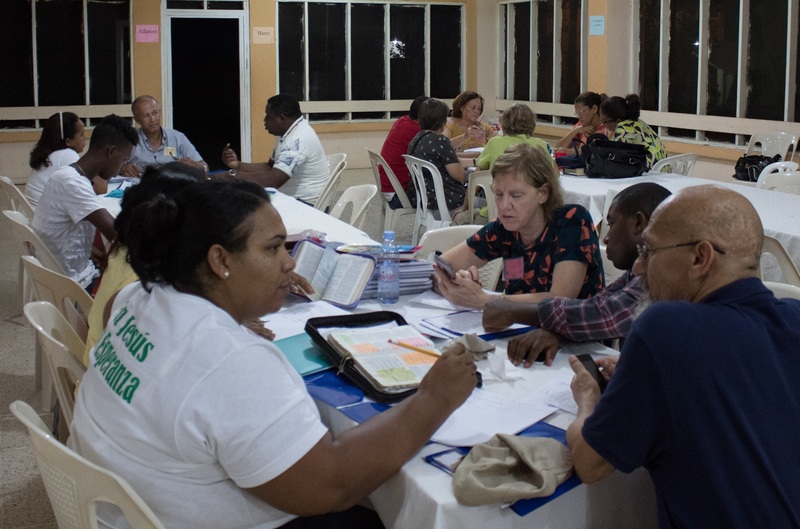 In the past these folks have four sets of six-month curriculum under their belts but we have never all met to work together, to take on the task of writing for one year. 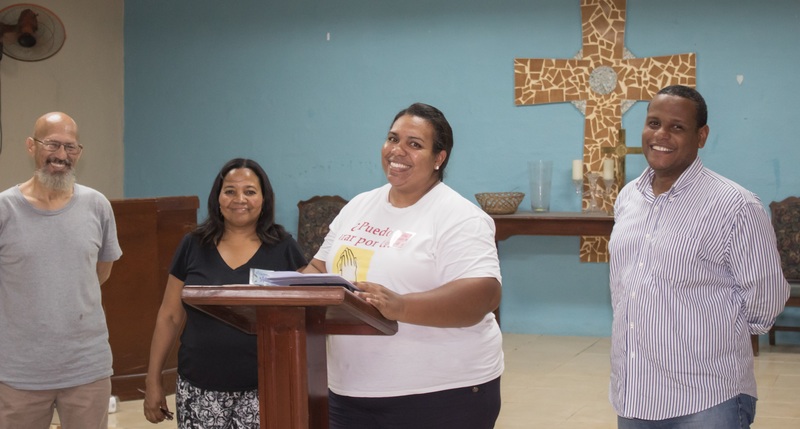 We organized into three groups of writers, took 6 blocks of themes and Bible passages and wrote a common objective for each block plus individual objectives for each lesson which are all connected to the objective for the central yearly theme. The work was difficult. 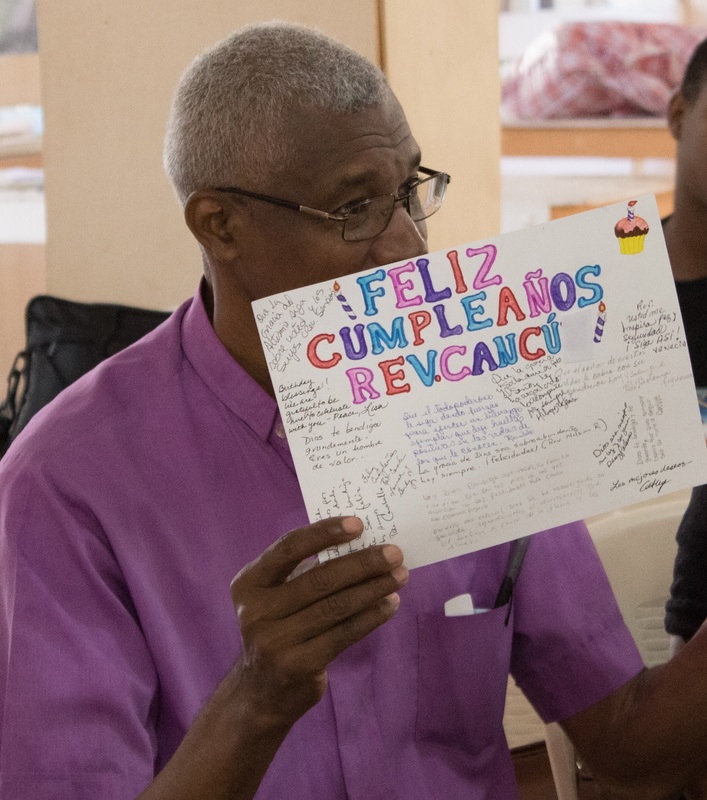 The challenge is always to contextualize their faith, traditions and customs in the midst of the Dominican reality and struggles. 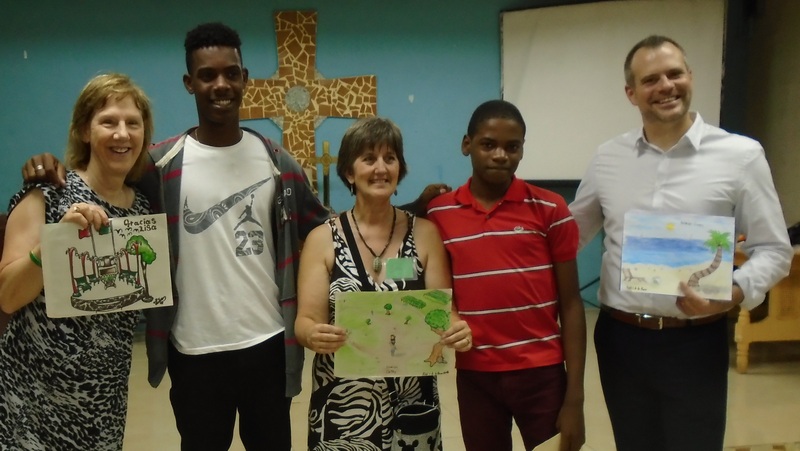 The groups were hugely successful and everyone felt fulfilled with the work. We were blessed to have special times for devotionals and worship to ask for God’s blessings and wisdom and to be unified in this ministry. 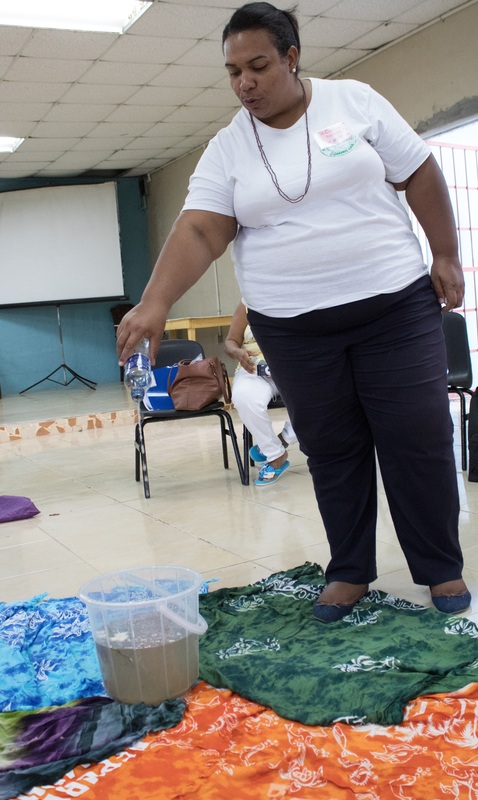 In our opening ceremony together we asked folks to bring bottles of water from the areas where they live. We then asked them to pour the water into a common bucket and share the reality of their lives. 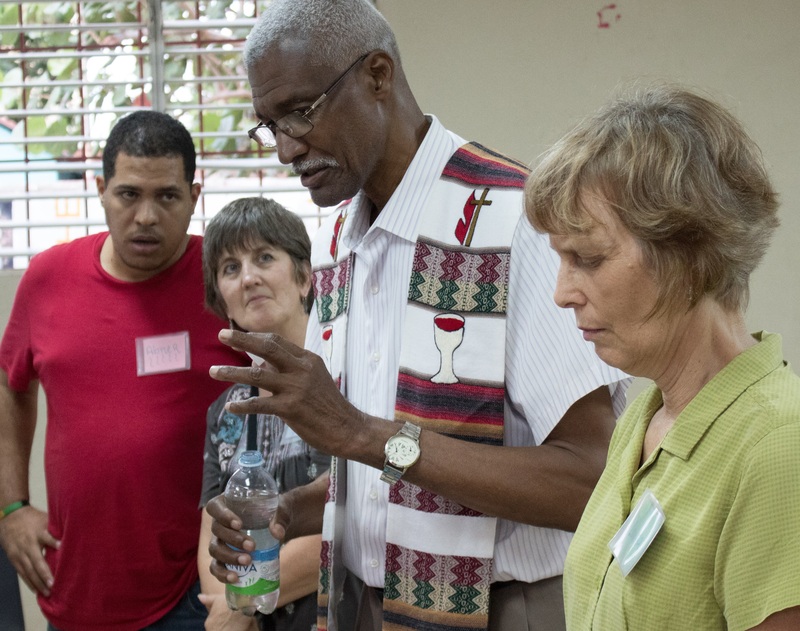 One pastor shared that this water represents the tears of the people in her neighborhood. 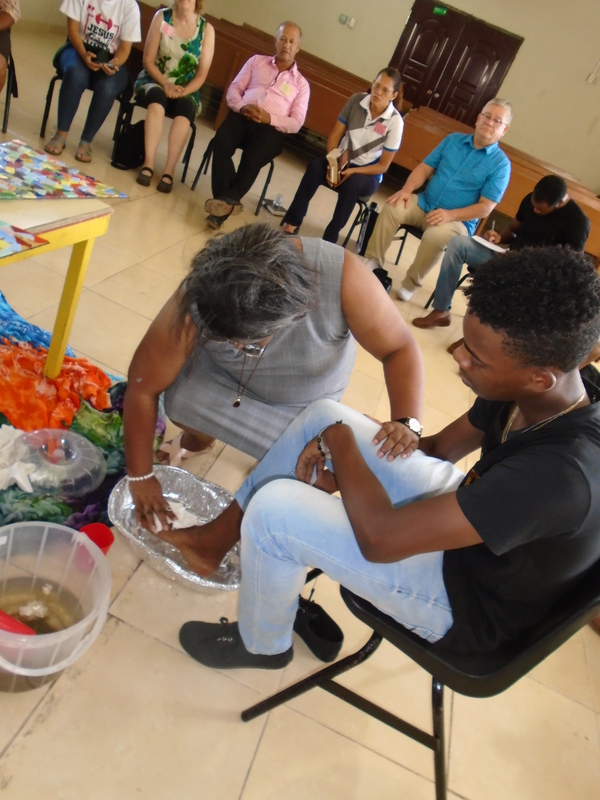 At the end of the workshop we washed each other’s feet with this same water as a sign of solidarity in our common effort to serve the IED church in this ministry of writing curriculum. 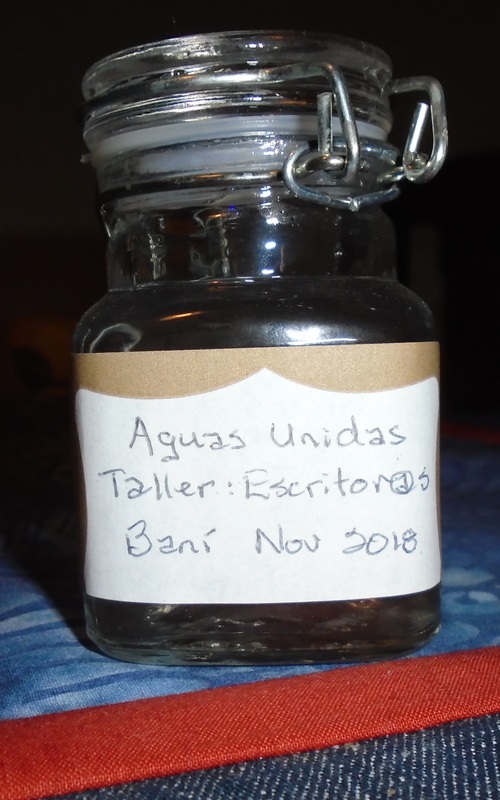 We then gave each person a little bottle of the water to take home as a reminder of the unity we share as IED curriculum writers. 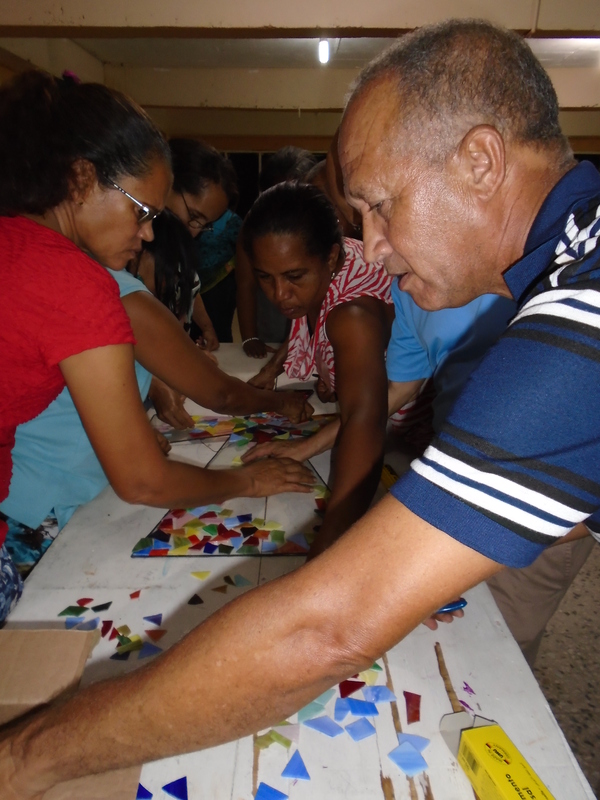 There were fun times too as we participated in dynamics that tried to tie in to our challenges. Laughter always seems to bring insight and relief in the midst of stress. 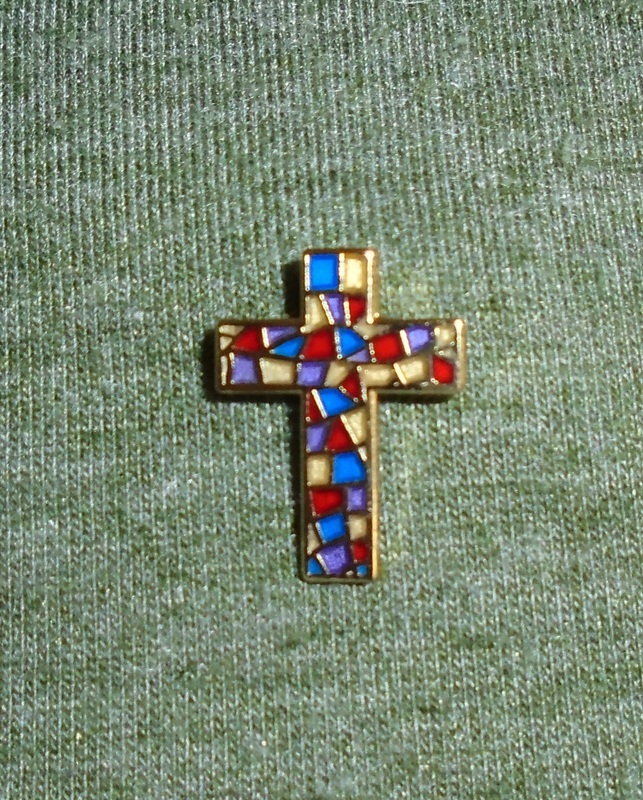 Each writer received a beautiful stained glass lapel pin and assembled a stained glass cross together to honor their work. These days have laid the base for this set of curriculum. 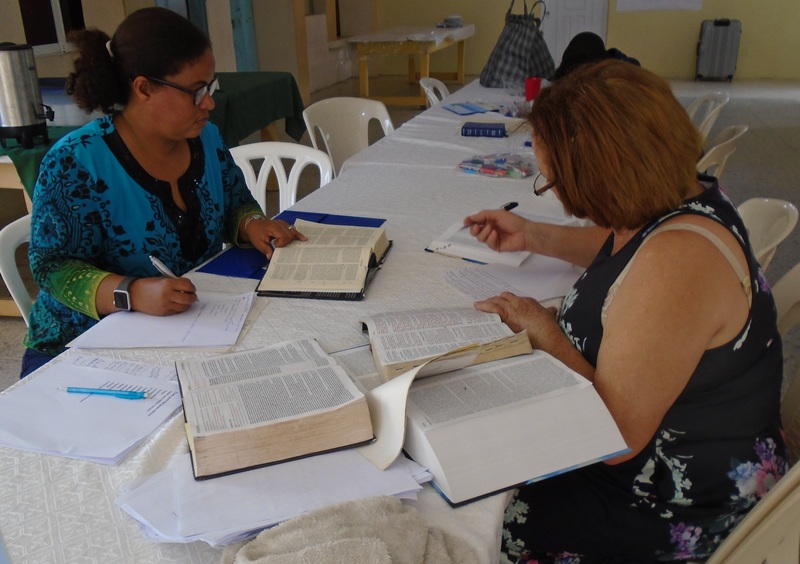 All the writers are committed to continue studying, praying and writing until the completion of these materials which is projected for mid-April. Thank you to Caleb and Julio. 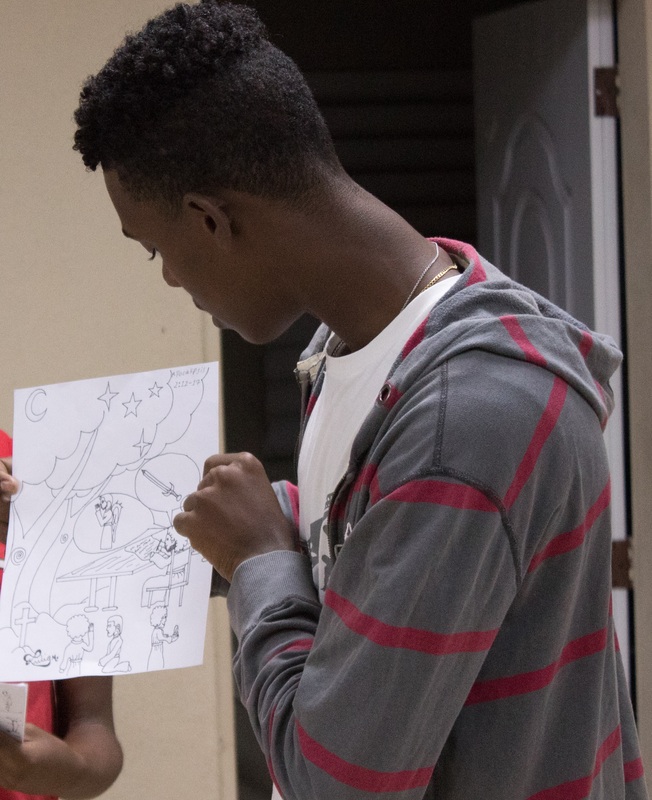 These two young men have drawn beautiful illustrations to be featured in the lessons.